Lots of people have been sharing their creative Halloween costumes online. Today’s costumes have to have lots of blinking LEDs, electroluminescent wire, and all sorts of other electronic effects. 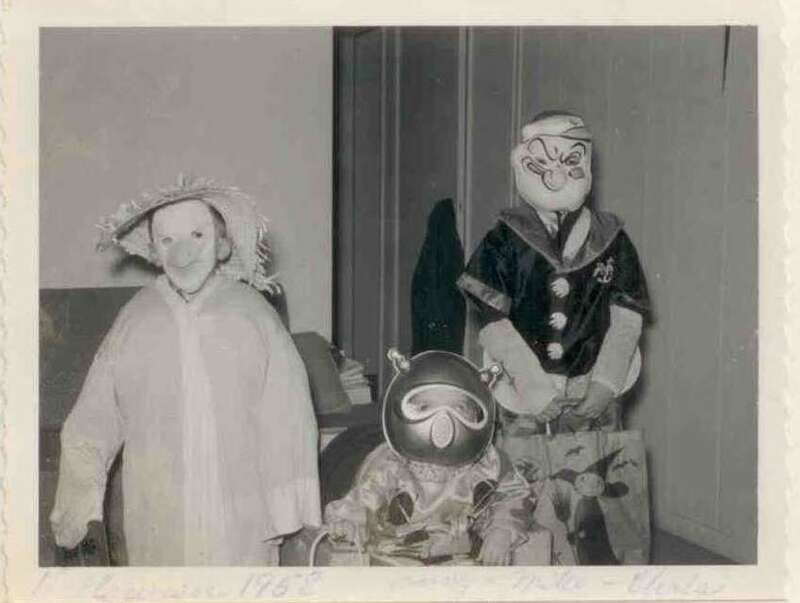 I can only imagine the kind of costume I might have dreamed up when I was a little kid if I’d had access to the electronics that I have access to today. 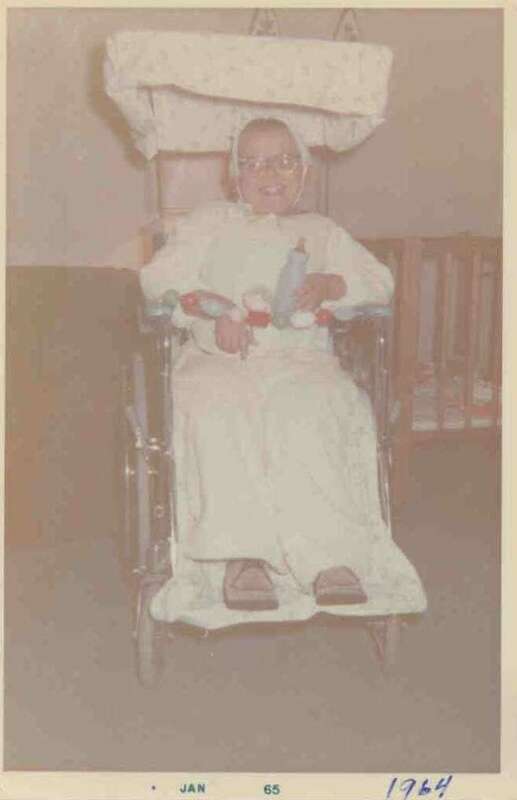 However as you will see below, my parents and I did get pretty creative in trying to design a Halloween costume that dealt with the fact I’m in a wheelchair. I think my favorite is this one from 1963 when I was 8 years old. We had recently purchased a washing machine or some other big appliance that came in a giant cardboard box. We reused the box for my costume and decorated it like a TV set. We cut a hole in the front for the screen and I dressed up in a cowboy outfit. That made me “A Cowboy on TV”. 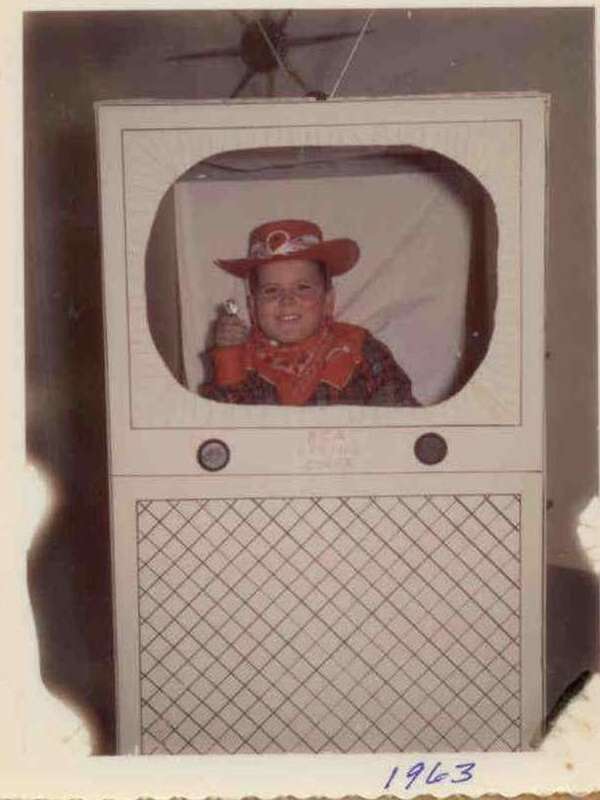 You probably can’t see it on this photo but written on the front of the TV was the words “RCA Living Color” even though probably at the time we only had a black-and-white TV. The problem with doing something creative is that you constantly have to try to outdo yourself over and over again. While in 1963 costume simply covered up the wheelchair, the 1964 costume sought to transform the wheelchair into part of the costume itself. A canopy was added to the wheelchair to make it look like a baby stroller. 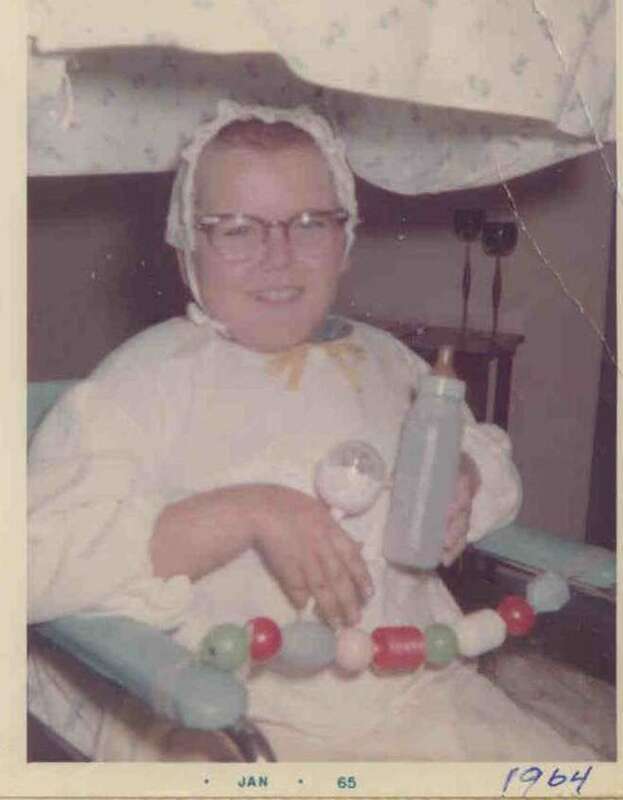 Of course that meant that I had to dress up like a baby. I don’t know how they ever talk me into doing this but I did anyway. Here’s a closer view where the photo is not quite as faded. 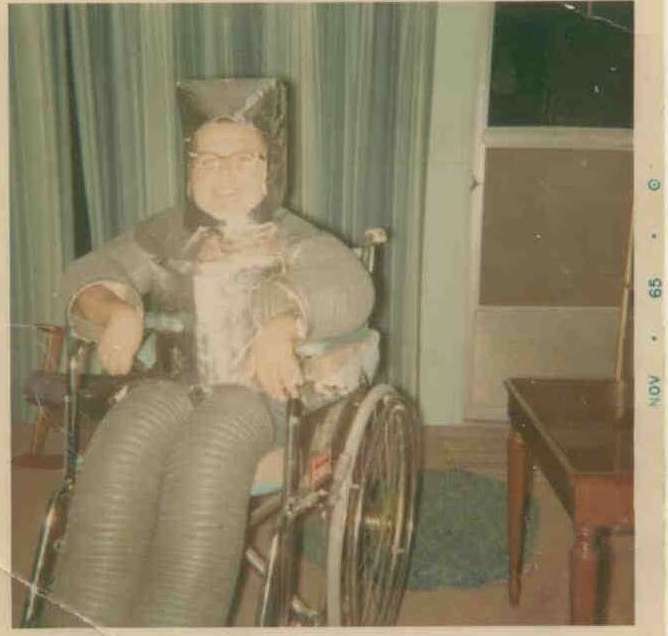 For 1965 we just sort of ignored the wheelchair when turned me into a robot. I suppose a robot could sit in a wheelchair. The arms and legs were made out of flexible duct work. The chest and head piece were cardboard covered with aluminum foil. I’m pretty sure that after that I didn’t do much trick-or-treating. 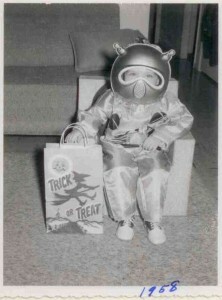 In years prior to that I always just got a ready-made purchased costume. The only photos I could find on many of those costumes go all the way back to 1958 where I was an astronaut before there even were astronauts. Or maybe I was a Martian who knows? Here’s another photo from the same year. 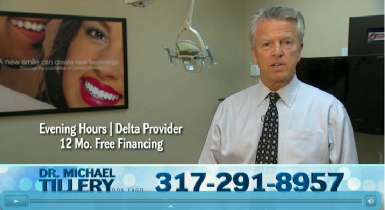 The guy in the Popeye costume is my former next-door neighbor and currently my dentist Dr. Michael Tillery. You’ve probably seen his advertisements on local TV. I’m not sure who the other person was. The writing on the photo is very faded. I tried adjusting brightness and contrast and could almost make out the word Jenny or Jeremy but I don’t remember anybody by that name. I have all sorts of ideas of how I could string rows of LEDs around the wheelchair or create fancy light show displays. I could put a string of LEDs around my wheels and use an accelerometer chip to detect when the wheels are turning and that would change the pattern of lights. It would be a lot of work and I never go to Hollywood parties or go anywhere like nightclubs where having a blinking outfit would be cool. So I guess I will stick to my usual electronic projects such as TV remote controls and toy helicopter controllers. Back in the 1980s my mother had a grant from the Muscular Dystrophy Family Foundation to create an accessibility guidebook for Indianapolis. The book was called “Navigation Unlimited in Indianapolis”. It was actually an update of an earlier book that the foundation had produced. Many different disability organizations had created such guidebooks for other cities around the country. This was prior to ADA and other accessibility legislation. She went around to hundreds of public places and measured doorways, surveyed restrooms, counted steps, measured curbs and scouted accessible entrances. After ADA and other building code changes I’m happy to say that for the most part such a guidebook is not needed. But there are still a few places where access is problematic. One guy has found a modern way to handle this problem. He has created an app using Google maps that allows people to rate various locations and facilities as to their accessibility or more importantly there inaccessibility to people in wheelchairs. Here is an article from Time online telling his story. My mother would’ve absolutely loved this. In fact I’m a little embarrassed I didn’t think of it myself.